Billy Joe Thomas was born in Oklahoma in 1942, but grew up in Texas. As a teenager he joined a band called The Triumphs, and through his success with them manged to get his solo career started. 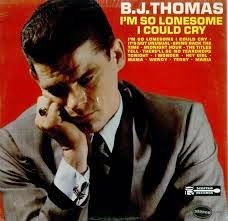 In 1966 his soulful cover of Hank Williams' "I'm So Lonesome I Could Cry" became a hit on Scepter Records, getting to #8 on the Billboard Hot 100. A follow-up single, "Mama", charted at #22. His first solo album, featuring both hits, was released the same year, presenting a mix of pop, soul and country styles. It included covers of Tom Jones' "It's Not Unusual" and Wilson Pickett's "The Midnight Hour". i meant Hooked on a feeling dude.....right?